Church St. Enoteca are hosting a series of regional Italian dinners and tonight, in the first of these dinners, we'll be exploring the region of Tuscany. 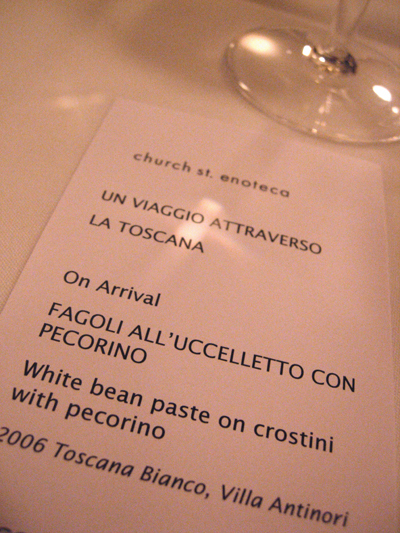 The starter was white bean paste on crostini with pecorino served with 2006 Villa Antinori Toscana Bianco. 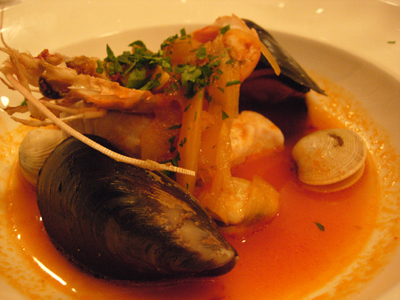 This is the traditional dish of the fisherman of Livorno - after selling the best of their catch, they would make this simple fish stew with the fish they had. 5 different fish have to be used, one for each c in cacciuccio. There's a lovely waft of saffron as the dish is set down before you - a bit of chilli to spike the dish but not enough to overpower the different fish. Pici weren't available so bucatini were substituted (as were some spaghetti due to a kitchen incident). A simple but classic combination. 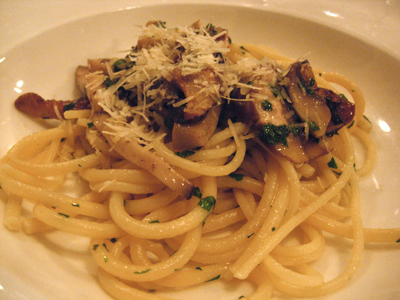 Interestingly when I was in Florence last year I did cook with pici and served it with a porcini sauce and pecorino from Arezzo - you can see it here. I drew the short straw when it came to broad beans, there were only two lonely halves on my plate though I think the person next to me had mine! 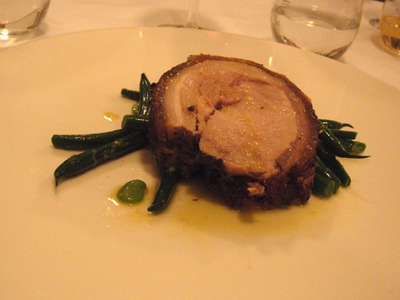 You can definitely taste a difference in the pork and it must be due to the breed used. 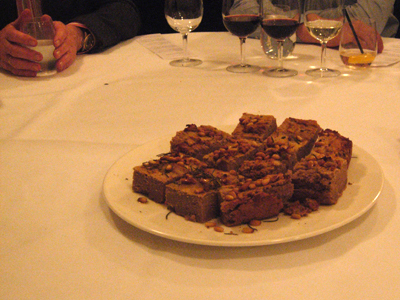 I can't honestly say that this was a very popular dish based on just how much was left behind on our table. It was just a bit too thick and dry, it really needed something creamy, be it whipped ricotta or mascarpone. Castagnaccio is also a dish I've made - and you can find it here.